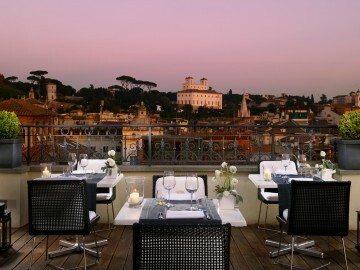 The antique beauty of Rome offers a magnetic appeal to tourists. 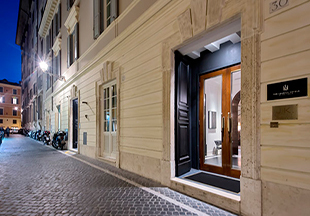 If you are looking for the perfect combination of luxury and comfort, come visit us at The First Luxury Art Hotel Roma for a once in a lifetime experience. We mean it! 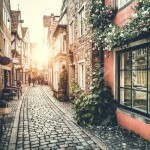 You will have a splendid experience, and let us tell you why. 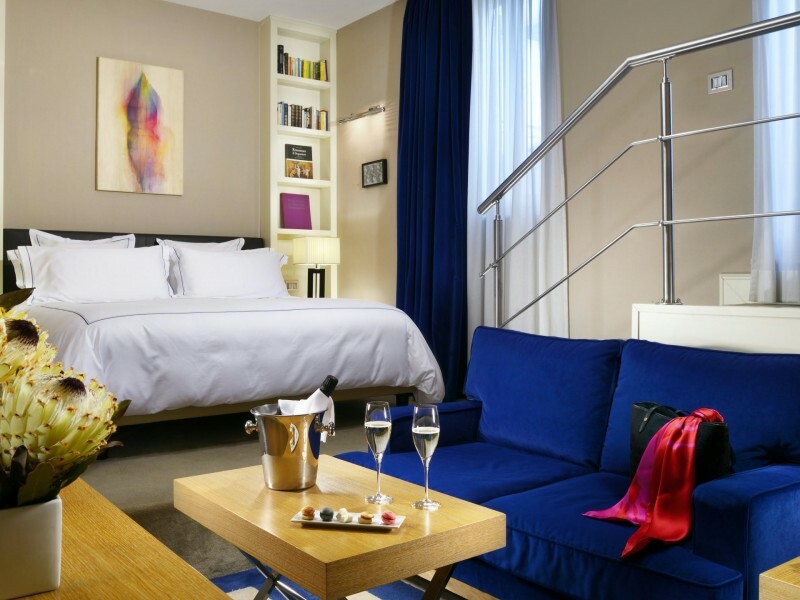 We offer our customers a variety of room choices, depending on their requirements and budgets. 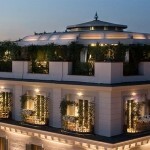 We provide a holistic hoteling approach, so we give importance to the needs of each individual client. Let us tell you a bit about our room facilities. 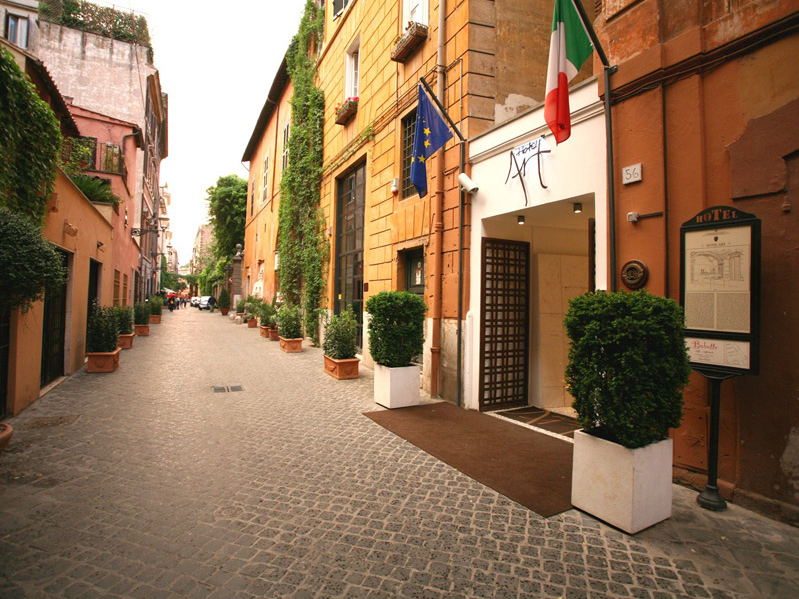 Situated near Piazza del Popolo, The First Luxury Art Hotel is within walking distance to all of central Rome’s main attractions. 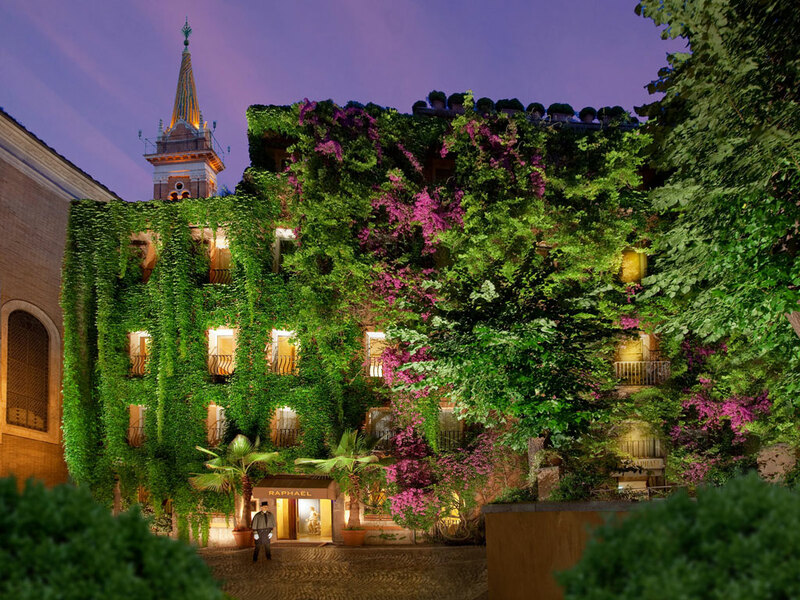 Housed in a 19th Century palace, guests will be enamored with the quirky yet refined contemporary décor and vast collection of both permanent and temporary art exhibits. 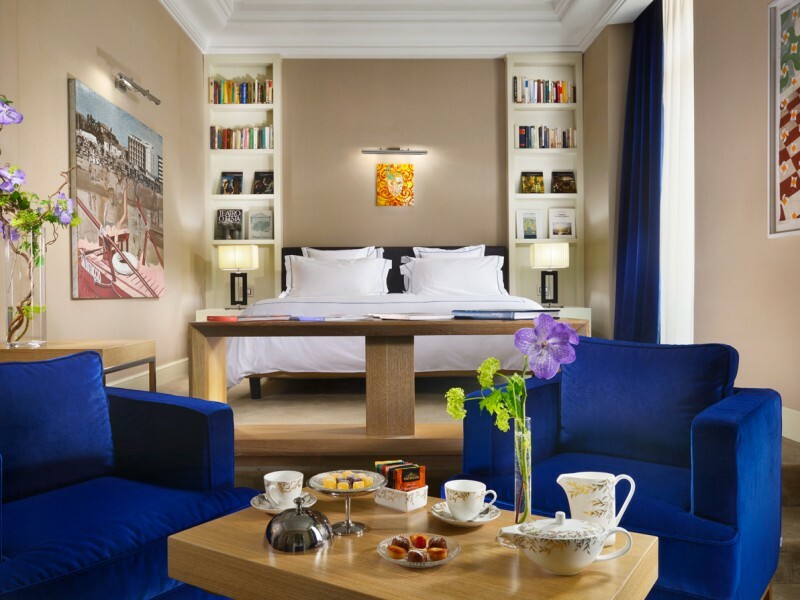 The muted walls and furnishings at this luxury boutique hotel are contrasted with bright pops of royal blue, and natural light floods in through a skylight and an enormous glass atrium. 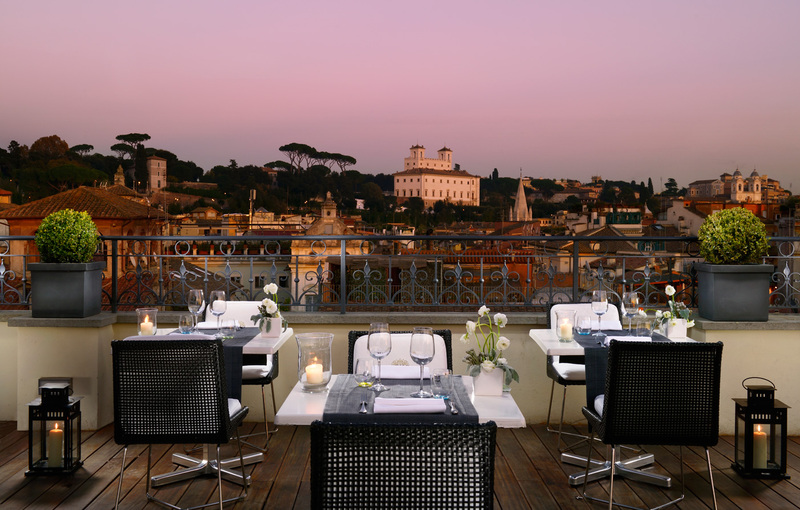 Amenities at this boutique hotel in Rome include a welcome cocktail on arrival, free in-room WiFi, iPod docking stations, parking, car service and a fitness center. 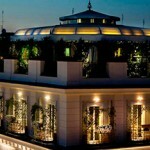 For dining, guests can enjoy the lounge bar or the rooftop garden, which is open all year for spectacular city views. 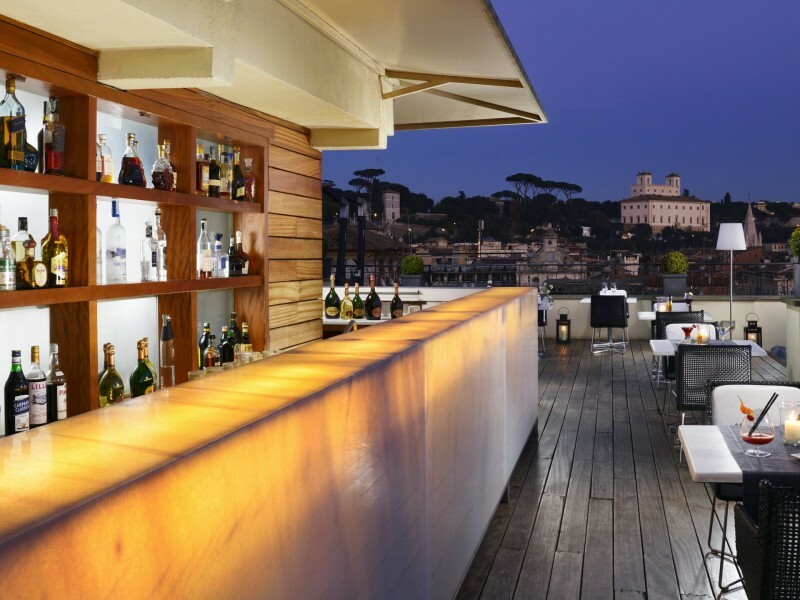 During the warmer months, lunch, dinner, and cocktails are served. The on-site All’Oro Restaurant is headed by Michelin Star chef Riccardo Di Giacinto, putting a modern twist on classic favorites. 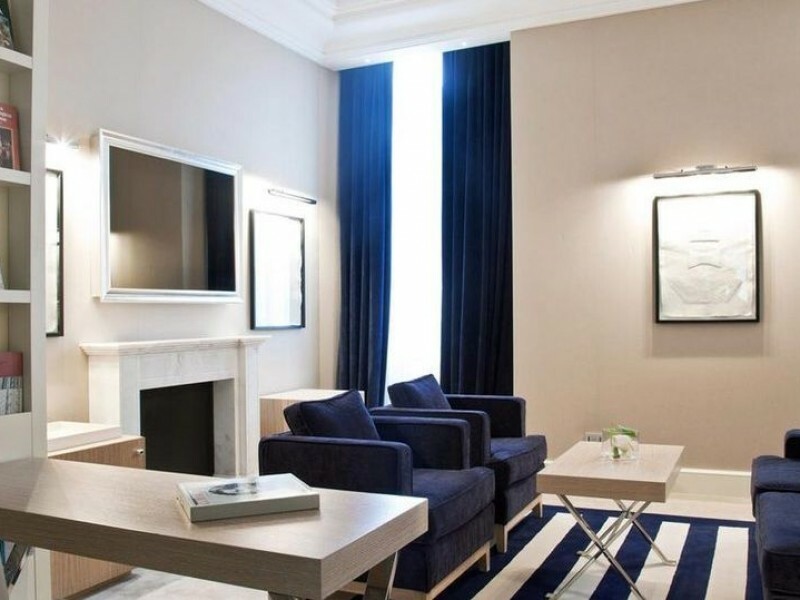 Blue velvet armchairs and sofas provide a welcoming place to relax, while the king duvet-covered bed is a welcome spot to rest at the end of the day. 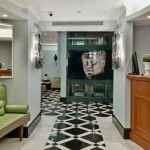 In addition to contemporary pieces of art, the rooms are also decorated with marble in both the bathroom and, in some rooms, a decorative fireplace. The separate living and sleeping areas are elegant and regal. 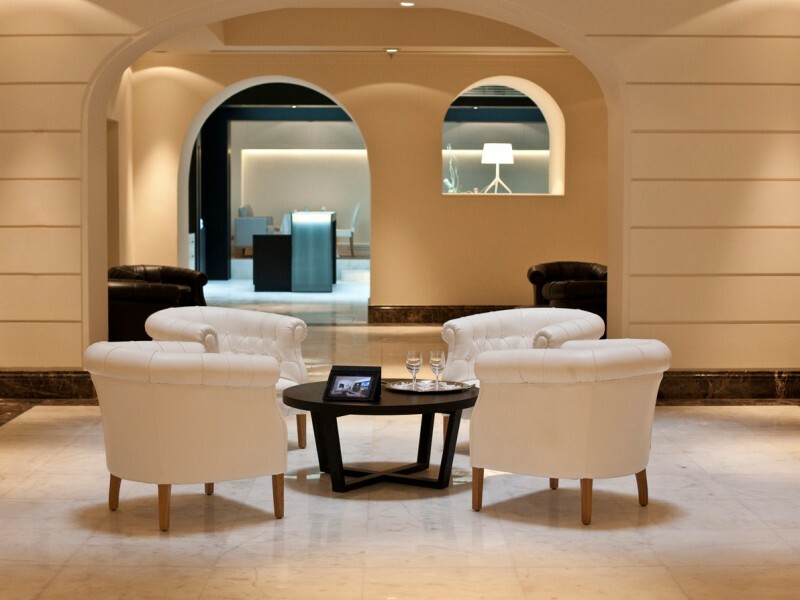 An Afyon marble fireplace and oak desk are some of the sophisticated details in these spacious accommodations. This category can be connected to a Jacuzzi Suite View to form the large Royal Suite. 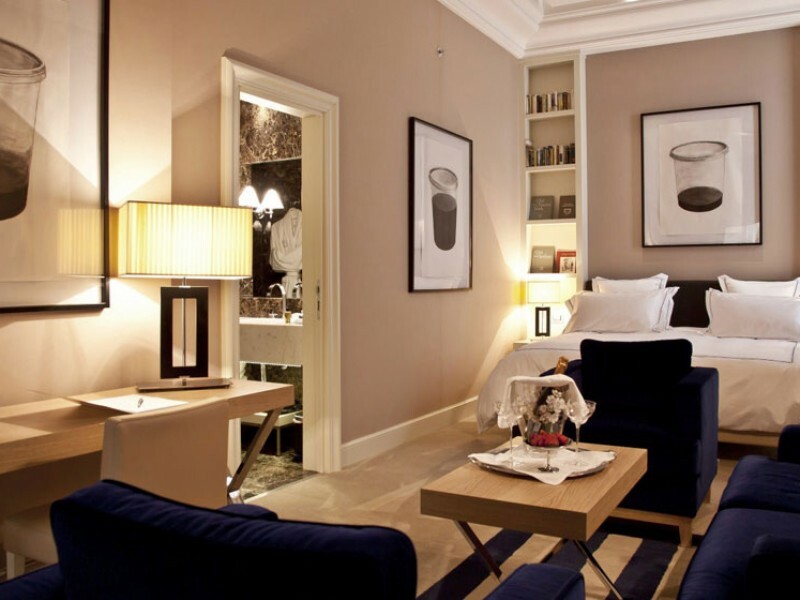 Like an apartment, this category of The First Luxury Art Hotel features a bedroom and two sitting areas, one in the master bedroom. Also enjoy a marble bathroom and a walk-in closet. An extra bed can be accommodated upon request. 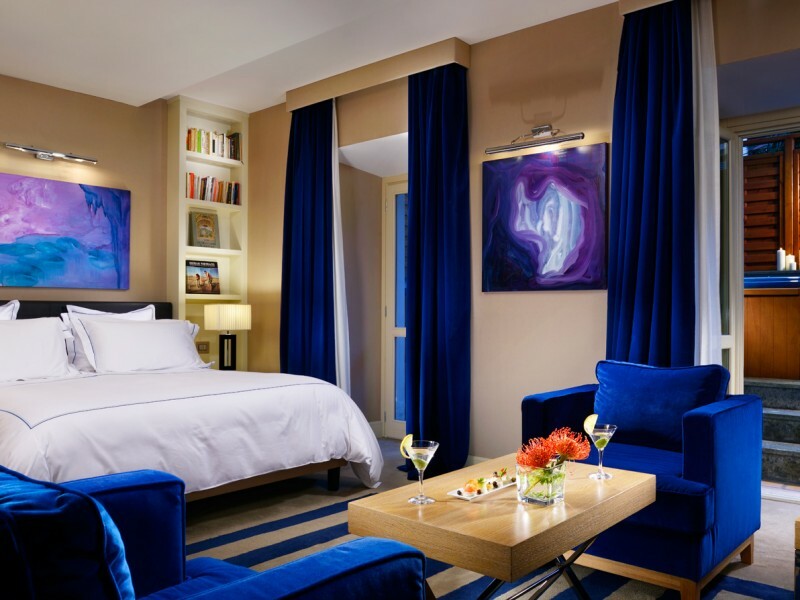 In addition to a sitting area, king-sized bed in the separate bedroom, and a walk-in closet, this suite category also features a small private terrace with seating and a Jacuzzi. 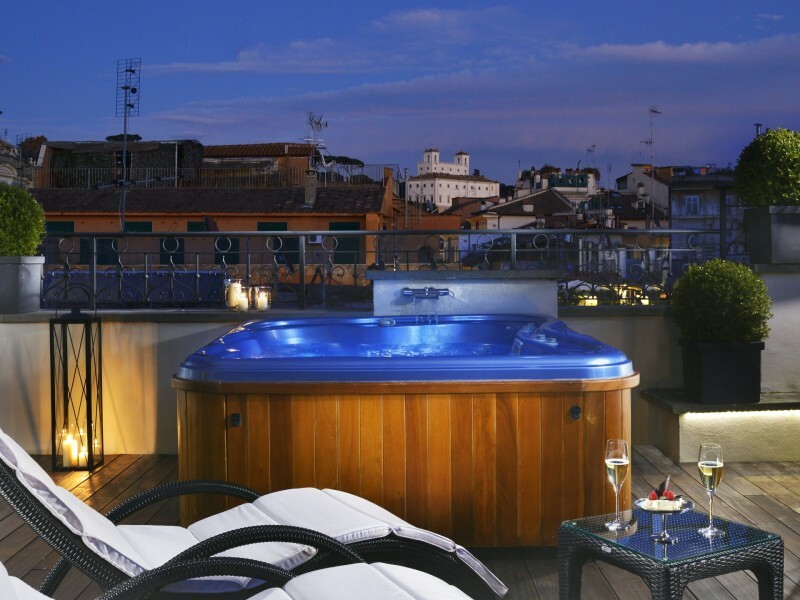 Enjoy the same amenities as the Jacuzzi Suite, but with a panoramic view of Rome from the terrace and Jacuzzi on it. This category can be connected to a Art Suite to form the large Royal Suite. 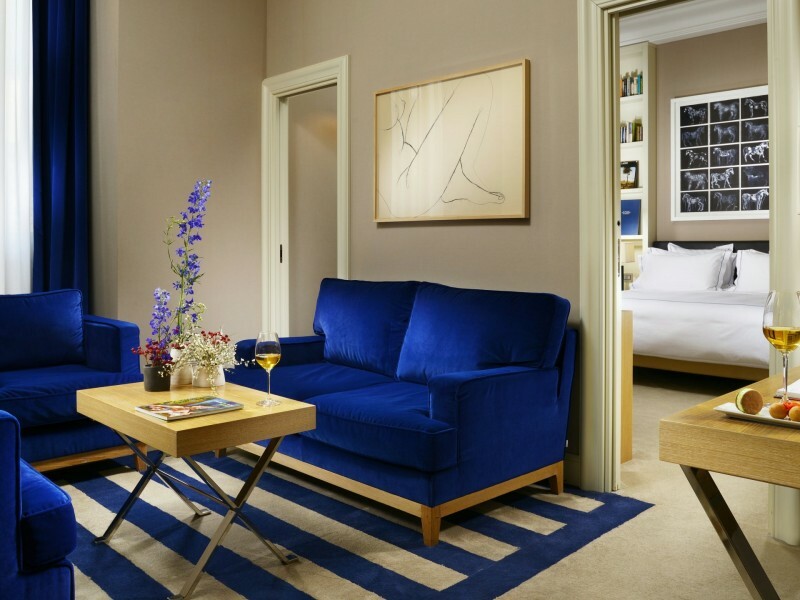 Those who don’t need the space of a suite will be more than comfortable in the Classic Double category, which features the same royal blue velvet touches, a marble bathroom, and contemporary art. Rooms can be joined for more space. 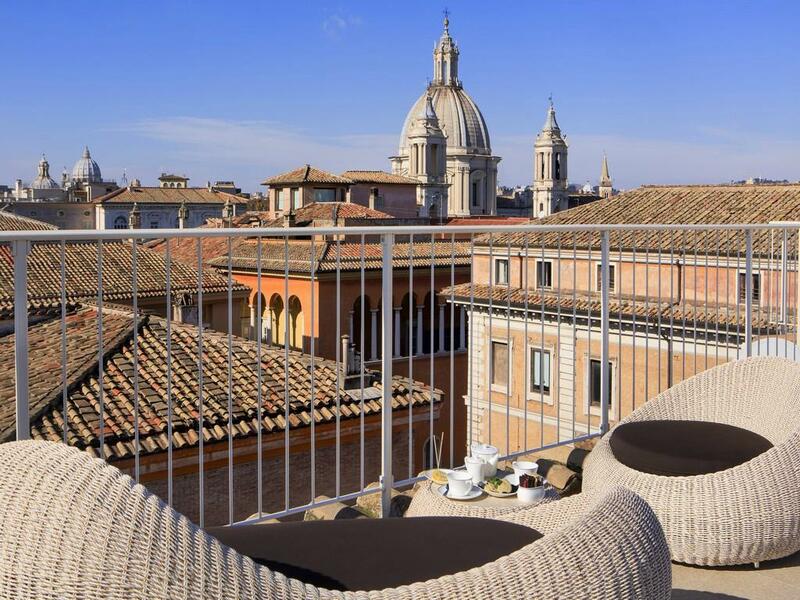 Just a few paces from Piazza del Popolo, this Rome boutique hotel is also close to the Spanish Steps, Borghese Gardens, Villa Medici, Via dei Condotti, Castel Sant’Angelo, and Vatican City. 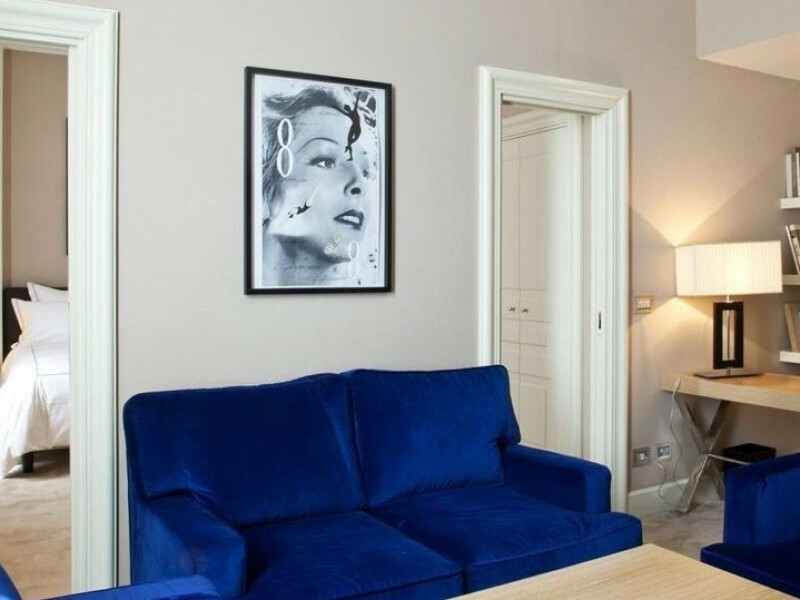 Just a block from the Tiber River, enjoy a stroll along its banks and then head to Via del Babuino and Via dei Condotti for shopping within every price range. All children are welcome. 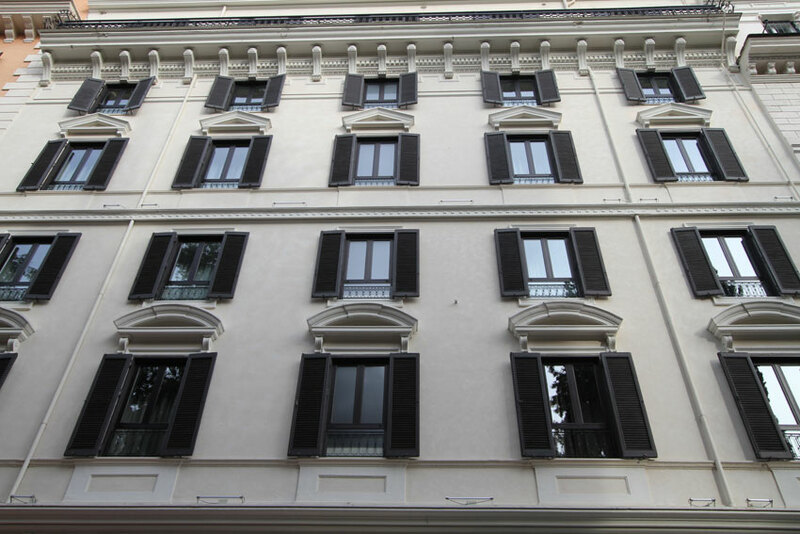 All children under 12 years are charged EUR 49.50 per night for extra beds. 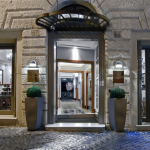 All further older children or adults are charged EUR 99 per night for extra beds. The maximum number of extra beds in a room is 1. Supplements are not calculated automatically in the total costs and will have to be paid for separately during your stay.